Extra 8 X 10's - $12.00 each. Extra Proof Books, complete with 4” X 6”s - $200.00 each. 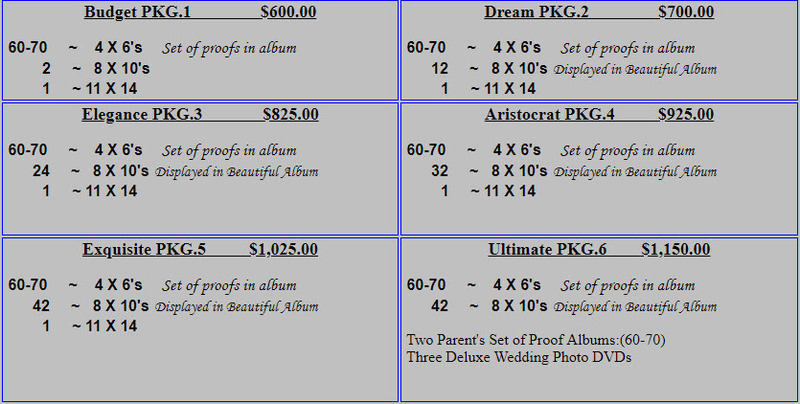 Proof books reordered after wedding $300.00. NO CHECKS ACCEPTED. We Except Cash and Cashiers Check. One-half (1/2) deposit on all jobs due at signing of contract with NO REFUNDS after forty-eight hours of signing. Balance should be paid on or before the date of the wedding. Quoted prices and packages subject to change without notice, unless client has signed a contract. A note of confidence: We use highly professional digitizing labs to process and produce your photographic moments that you’ll cherish forever!